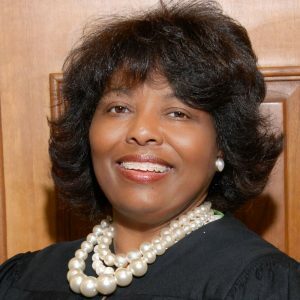 On April 15th, Lehman College welcomes Judge Jo Celeste Pettway for a dialogue with the first Black female elected or appointed to the state bench in Alabama. She will deliver a talk, moderated by Dawn Ewing-Morgan, Lehman’s Chief of Staff and Chief Diversity Officer, on history, legacy and art that will be a part of “The Gee’s Bend Tradition” exhibit. The Gee’s Bends quilts, 14 of which are on display this semester at the Lehman College Art Gallery, were made by generations of African-American women living in the isolated area of Gee’s Bend, Alabama. The women, descendants of slaves and sharecroppers, initially quilted to bring warmth to their poorly insulated homes, yet what they designed—historians say there may be as many as 10,000 quilts—are stunning, colorful examples of folk art and the story of the South. Pettway’s own story could also serve as inspiration for students and others in the Lehman community. She is the first Black female appointed or elected to the State Bench in Alabama and was appointed in 1984 by then-governor George Wallace, who was an ardent segregationist during the Civil Rights Movement. For the past three decades, she has served as District and Juvenile Judge of Wilcox County, Alabama, handling cases involving paternity and child support, juvenile maters, small claims, civil, criminal misdemeanors trials and felony preliminary hearings. Judge Pettway is a graduate of The University of Alabama, where she received her Bachelor of Social Work (1976), Masters of Social Welfare (Administration; 1978) and Juris Doctorate (1982). She has also served as the vice president of the Alabama Juvenile Judges Association. For more information on the Gee’s Bend exhibit, which ends May 6, visit here. Judge Pettway’s talk will be at 4pm in the Speech & Theatre Building—Studio Theatre.